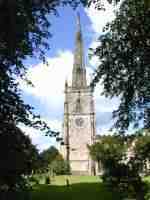 Repton, This is located in South Derbyshire.  Photos of Repton, South Derbyshire, England. Repton is South West of Derby on the B5008 road after Willington from new A50 junction. Repton was the old capital of the Mercian kingdom, and a monastery was founded here in AD653 which was destroyed by the Danes during their conquest of the area in AD874-875. Other Information : This is a row of thatched cottages on High Street in Repton. Other Information : This is Saint Wystan's church in Repton, It was built around AD975 and was extensively altered during the 13th to 15th centuries. The Anglo-Saxon crypt under St Wystan's dates back to the 7th Century. Other Information : This is inside Saint Wystan's church. Other Information : This is the Anglo-Saxon crypt inside Saint Wystan's church.King Ethelbald's bones were entombed in this crypt in AD757, King Wiglaf in 840 and his grandson St Wystan in 850. It is one of the oldest intact buildings in England! Other Information : These ancient steps down to the crypt have been worn down by the thousands of medieval pilgrams. 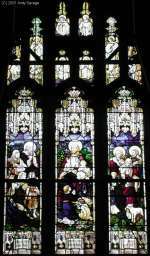 Other Information : This is one of the very ornate stained glass windows in Saint Wystan's church. Other Information : This is "The Cross" Market cross in the centre of Repton village. If you take the left turn as you head towards the cross you will see the Brook Farm Tea Rooms on your left at the bottom of the hill. Other Information : This is a closer view of the cross in the centre of Repton village. This is a roundabout for cars. Other Information : This is the 12th century arch to Repton school. Sir John Port incorporated some of the surviving buildings into Repton school, which was founded in 1556. The film Goodbye Mr Chips was filmed here. Other Information : This is one of many different buildings that form Repton School. Other Information : This is one of many different buildings that form Repton School. St Wystan's church can be seen over the school here. Other Information : This is Brook Farm Tea Rooms which is located on the left just after crossing the Brook. They do a nice Sunday dinner here and you can sit in their garden which looks onto the brook. Other Information : This is Brook Farm Tea Rooms. Other Information : The building on the left used to be the Court House and was built in 1907. The pub is the Boot Inn and is located on Boot Hill.